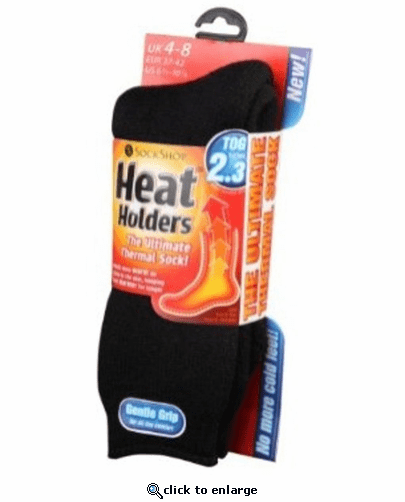 Keep feet warm on the coldest of days and pull on this pair of Heat Holders - the ultimate thermal sock! An extremely high Thermal Overall Grade (TOG) of 2.34, this thermal sock is 7 times warmer than a basic cotton sock. Heat Holders are made from a specially developed heavy bulk yarn which has extreme thermal qualities. With long pile cushioning, these thermal socks will help keep feet fully comfortable and supported. The inside of each sock has been intensively brushed that not only feels sensationally soft but also traps warm air close to the skin keeping your feet warmer for longer. The specially developed advanced fibers provide high performance insulation against cold with superior moisture wicking abilities. 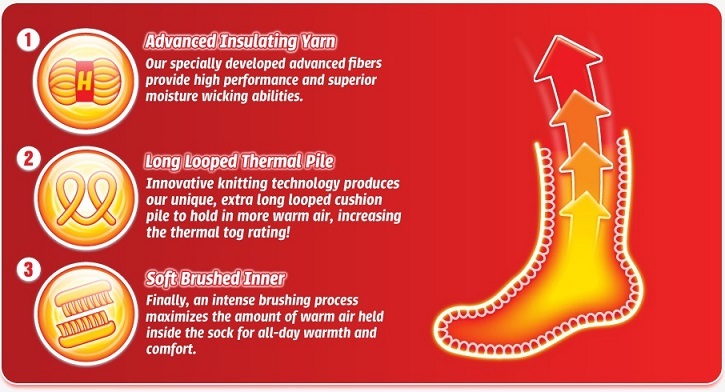 The innovative long looped thermal pile knitting technology products a unique, extra-long looped cushion pile to hold in more warm air, increasing the thermal TOG rating. Using an intense brushing process produces a soft brushed inner fabric that maximizes the amount of warm air held inside the socks for all-day warmth and comfort. Care and Washing: Remove any tags with scissors, do not rip. Machine Wash, Permanent Press on the Warm setting (40 degrees Celsius, 105 degrees Fahrenheit) with a mild detergent. Hang Dry or Lay Flat. Do NOT Bleach. Do NOT Dry Clean. Do NOT Tumble dry. Do NOT Iron. Materials: 91% Acrylic, 5% Nylon, 3% Polyester, 1% Elastane. ProsSo soft and comfortable you won't want to take them off They are very well made. I have worn one pair for almost two years every night in bed and they still don't have any holes. I have cold feet. These socks keep my feet warm at night and when I'm watching TV in a drafty room! Heat holders definitely hold heat! I was skeptical about these socks before I ordered. I am now very happy to have gone ahead and ordered. These socks are not only warm and very comfortable, but they are lightweight and hardly know you have them on. They are roomy and not tight.